Considering the societal expectations grounded in Calvinist Protestantism that characterized 19th century New England, Emily Dickenson’s decision to spend much of her life in seclusion made sense. While some speculate that the poet was a recluse, among other things, most now recognize that Dickinson's lifestyle was in fact a choice she made in an attempt to achieve true actualization of the self. Dickinson was smart; she understood the rules. And she knew that if her proclivity for self-expression were to be made public, then the fate of her family was doomed to relentless scrutiny. So she made a decision. She chose to reserve her thoughts for her poetry, which she wrote in the one place where she felt safe enough to experience total freedom: the upstairs corner bedroom of her Amherst family home. 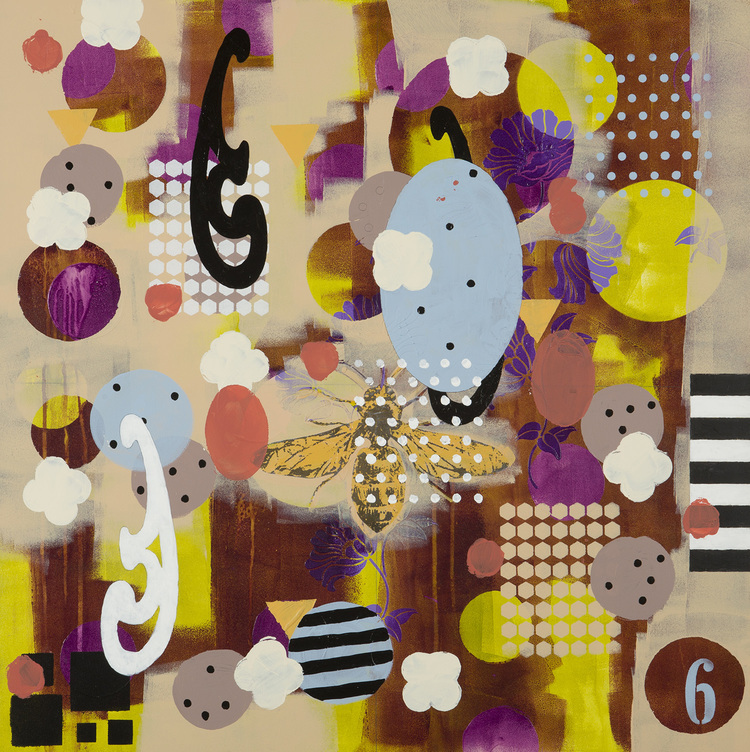 A number of themes that run through Dickinson’s poetry can be seen in Wini Brewer’s vibrant works that infuse abstract and representational elements through a unique process of layering colorful acrylics against black and white graphics. Nature is one, but more than the inclusion of birds and bees into Brewer's compositions is a balanced ease that coincides with Dickinson’s metaphysical notions about the interconnectedness between every being, thing, idea, and experience. The other theme that runs throughout the works of both Brewer and Dickinson is what writer and curator Lisa Derrick identifies as “what it means to be a woman.” In The Huffington Post, Derrick suggests that Brewer "is a role model for women.... Twenty some odd years ago, when [Brewer] was fifty, she went to art school [to study] painting, drawing, photography, and sculpture.” How often do we hear stories about middle-aged women who pick up and leave the familiar behind for the sake of embracing life and all its wonders? Since moving to Southern California, the Connecticut native has amassed an impressive CV: the recipient of two Vermont Studio Center residencies, Brewer has also exhibited at several venues including Pharmaka, Coagula Curatorial, La Luz de Jesus, Crussell Fine Arts, Red Dot Gallery, LA Artcore, Barnsdall Art Center, and the Palm Springs Art Museum. It can put me in a weird place when asked to participate in a show as an artist or curatrix. A lot of the time, I feel it's more about the asker, who hopes I'll fall into the trap of shameless self-promotion and by extension give their project exposure, rather than it being about a bigger picture of how we mesh. I am naturally a bit wary of people who offer me things and want me involved in their projects-maybe I have watched too many Lifetime movies and telenovelas, but I pretty much suspect ulterior motives from people, so I end up saying no more often than yes. Creating an art piece takes a certain focus that takes me out of my writing headspace, which is why I only showed twice this year (and not in shows I curated). I curated seven shows in 2014 and turned down as many, trusting my gut more than my brain (and I don't always write about shows I'm doing--whether as an artist or a curator). By the time January 2015 draws to a close, I will be into my ninth curation, relying on instinct more than intellect to make my choices, and on what brains I have along with some elbow grease to do this. In 2013 I took Curators College, a six-week class in curation from Coagula Curatorial owner (and fellow HuffPo contributor) Mat Gleason, which is where I met Wini Brewer. Mat paired us up to curate a one-night show using art pulled from his office storage space. Wini was the oldest person in the class--she exuded dignity and reserve while my grace and charms are um, a bit more earthy. In the course of pulling art, designing a concept and getting the night together, Wini and became colleagues and I discovered her playful and profound side, while she resolutely tapped into the nicer and more efficient parts of me. Our Coagula pop-up was a success; we sold art, made people happy, got some accolades. That night led to me being able to launch "Two Johns and a Whore" nine months later, and well--here I am, due in a large part to Wini being Wini and Wini letting me be a very effective aspect of myself. When the time came to curate the Homeboy Industries 5K pop-up, Wini was one of the artists I thought of; her art is friendly, approachable but with a subversive edge. Wini likes to disrupt the status quo with color and the juxtaposition of graphic elements, and she does it in a very ladylike and elegant way. She also volunteered, showing up at 5am helping to hang art (and to take it down six hours later), showing the over eighty pieces of art from fifty artists that hung on a chain link fence to hundreds of visitors. "I don't want people to talk about what a great artist I am when I'm dead. There's no fun in that. I want people to enjoy my art while I'm alive!" The same sentiment holds true with the artists I'm hanging at the LA Art Show. They do what they do so people know they are here, to express their struggles and triumphs, to show people their world--the interior and exterior, to connect and resonate. Wini brings forth her interior world using birds and bees, flowers, arabesques and scrolls. She layers acrylic brushstrokes and stencils, letters, numbers and patterns. It's bright, friendly, accessible art, but beneath the surface cheeriness, using her visual vocabulary, she asks questions about what it means to be a woman, a daughter, a wife and a lover. She draws on Emily Dickinson, environmental concerns, Americana, numerology, mythology to create rich visuals, a mille-feuille of contexts and subtexts. I have a fantasy of seeing a mural by Wini Brewer up on a city wall in LA, with additions and elaborations from a group of experienced Cholo graffiti artists, mixing my worlds, the co-mingling of a sweet 70-something year old lady with brazen dudes. Without meaning to become one, Wini is a role model for women as we age: Twenty some odd years ago, when she was fifty, Wini went to art school, studying painting, drawing, photography, and sculpture at Art Center College, California State University Long Beach, and University of California Los Angeles. She married a younger artist and they live/work out of their studio home in the California desert and their spaces at the Brewery. She is the recipient of two Vermont Studio Center residencies, and she has exhibited throughout Southern California at galleries that include Kerckhoff Gallery UCLA, Pharmaka, Coagula Curatorial, La Luz de Jesus, Crussell Fine Arts, Red Dot Gallery, LA ArtCore, Barnsdall Art Center, and the Palm Springs Art Museum. She is over 70, paints daily, is creating a book about her art, and embraces life with a glorious spirit and sense of wonder. Her art expresses an agelessness, yet reveals the wisdom of experience. Wini Brewer's paintings embrace the ambiguous nature of memory. There is a joy in her compositions, a refreshed retelling of some anecdote from a day long ago, or even last month. Her pictures are a sip of lemonade or chardonnay as that lost summer day unfolds, is rediscovered and is cast again as a memory involving today. Her art is the worn truth of time delivering the totemic images of our forgotten consciousness to the present. A friend and a drink and a relaxed afternoon seem the right accompaniments to this artist's pictures. Her tales are without words though, images painted and collaged together in a casual manner, with an attention to their subject amidst a casual composition. But this is not a casual artist. Her pictures may relax the viewer as much as a late sunset porch swing, but it is the sort of meditative alertness that brings about an epiphany. Wini Brewer produces little moments of putting it all together. A single painting of hers is like a short yarn while a few placed together have the makings of a rich novel. The details emerge in the associations. The patterns are in our minds but they manifest on the wall. A wall's worth of them are like the family quilt that tells so many stories from years of consistency. Her art is consistent in its quilt-like squares, but unique in each singular vision. While themes are recurring, they are never repeated, and when looking for patterns, one is more likely to arrive upon an unexpected twist of an old yarn, a truth redefined. You are looking at your memories and they have been painted as you never realized you remembered them.